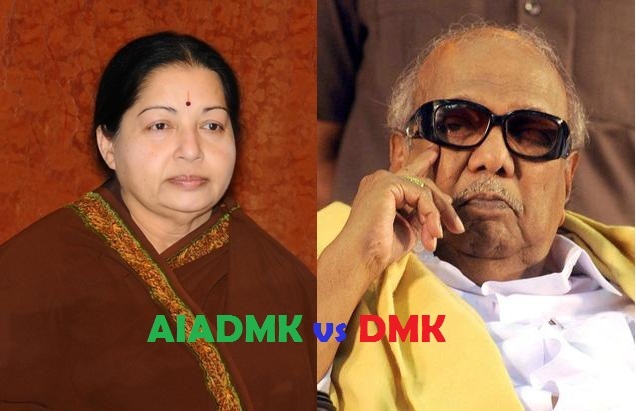 There is a close fight between AIADMK and DMK+, exit polls are confused in predicting a winner in assembly elections. Chanakya exit poll and Aaj Tak Axis poll predicting that DMK and INC alliance is going to win 2016 Tamil Nadu assembly elections. Times Now C voter is predicting that AIADMK will retain the power for next 5 years again. BJP will able to win maximum 3 seats in the Tamil Nadu Vidhan Sabha elections. Latest Tamil Nadu exit polls are predicting that Jayalalitha (Amma) might have to lose the power in Tamil Nadu, however, it would be a very close fight. India Today and News Nations are predicting that Jayalalitha’s ADMK will get around 100 seats while C voter predicts that Jaya will easily win the 139 seats in Tamil Nadu. Poll of Exit polls as per NDTV is predicting that there will be a close fight between AIADMK and DMK. Tamil Nadu assembly elections had conducted on 16th May 2016 and fate of candidates in 234 constituencies will be decided on 19th May. Party with more than 118 seats will claim a majority and can form its government. Tamil Nadu opinion polls are conducted by various news and media channels to give a better idea of the current situation. These exit polls are conducted on a limited number of people and they are just a prediction of results depending on their views. The current CM of Tamil Nadu is J. Jayalalithaa of AIADMK. She has already served five terms as a Chief Minister of Tamil Nadu. It will be a tough fight for her to retain her third consecutive term in this assembly election. The main competitions will be between AIADMK and DMK. It will be interesting to see that who will win Tamil Nadu election 2016. The India TV-CVote prediction says that AIADMK (All India Anna Dravida Munnetra Kazhagam) will be the leading party in this election. This party is expected to win 116 seats this time. DMK (Dravida Munnetra Kazhagam) is following it with 104 seats. BJP (Bharatiya Janata Party) will not be able to mark its presence, and others are expected to win 14 seats. According to Loyola College survey, the results for AIADMK and DMK will be rather close. AIADMK is expected to win 80 seats and DMK with 76 seats. The DMDK and its allies will be able to get 16 seats this time. BJP will bag a total number of 7 seats in this election. Tamil Nadu opinion polls conducted by News Nation shows that AIADMK and DMK will share an almost same number of seats. AIADMK will conclude win on 105 seats whereas DMK will be having 109 seats in their bag. BJP will fail to win even a single seat, and DIDMK will be just ahead of BJP with 1 seat. Others will be having a share of 19 seats which is a good number. Times Now-C Voter survey predicts a majority for AIADMK, showing their win on 130 seats. DMK is expected to win 70 seats, which is giving a weak competition to Jayalalithaa’s AIADMK. BJP doesn’t seem to open their account with 0 seats in their basket. Others are expected to win 34 seats, which is a good number. AIADMK won the 2011 assembly elections in Tamil Nadu by securing 150 seats out of 234 seats, while their main political competitor DMK managed to win only 23 seats. It was Jayalalithaa’s second consecutive win and total fifth win. She served her term as chief minister of Tamil Nadu for 5 times. It is interesting to know that M Karunanidhi of DMK also served as CM of Tamil Nadu for five times. Various opinion polls and surveys suggest the latest trends and predictions of Tamil Nadu assembly elections 2016. Most of the surveys are predicting that Jayalalithaa’s AIADMK will lead by a little margin over M Karunanidhi’s DMK. Surveys also predict that BJP might not be able to cross the double digits in terms of seats despite Modi effect. The leading parties are AIADMK and DMK among which the next CM will be decided, Other parties and Independent (IND) candidates will play a vital role in deciding the ruling party if none of the political partiy is able to secure a clear majority.